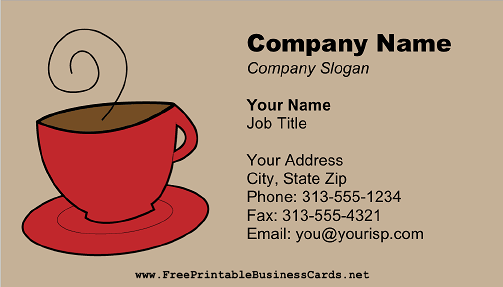 This printable business card with a red coffee mug with steam coming out is perfect for a coffee shop, barista, or any coffee lover. This business card is available in Microsoft Word (.DOC) format: Just download it, open it in Word (or another word processor that's compatible with the DOC file format), and customize it before printing. Some of our business cards can now be customized online for free without the use of a Word document editor, and downloaded as a PDF file. If you don't see a business card design or category that you want, please take a moment to let us know what you are looking for.